SAVE MONEY ON THIS BOWLING FALL SPECIAL DEAL!! 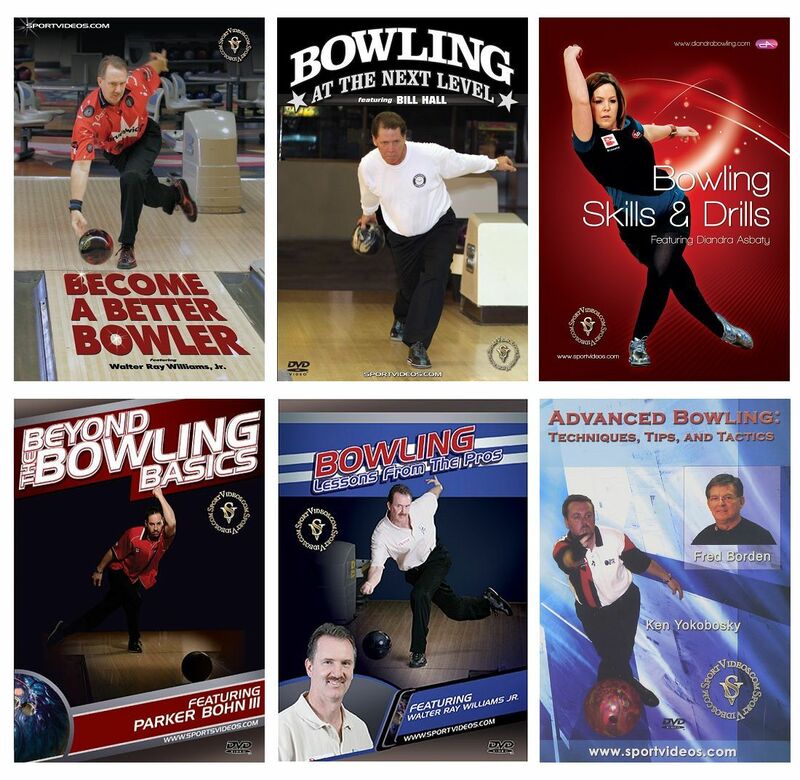 Become a Better Bowler featuring Walter Ray Williams Jr. Improve your bowling with personal lessons from a true legend in the sport. This download features seven-time PBA Player of the Year winner, Walter Ray Williams Jr. In this highly-informative program, Williams shares numerous tips that he has acquired during his stellar career. Among the topics covered are: the grip, the targeting system, hand releases, step drills, nuances of bowling, lane play, common problems, the 2-handed release, shooting spares and splits, practice tips, and the mental game. Whether you are a beginner or an experienced competitive bowler, this program will be beneficial to improve your skills and consistency. Walter Ray Williams, Jr. currently holds the record for all-time PBA Tour career titles (47) and total PBA earnings (over $4.3 million). He is a seven-time PBA Player of the Year winner and has won at least one PBA Tour title in 17 consecutive seasons. Through the 2012 season, he bowled 87 career 300 games in PBA competition. Walter Ray was inducted into the PBA Hall of Fame in 1995 and into the USBC Hall of Fame in 2005. Williams is also a nine-time World Champion in pitching horseshoes (three junior titles and six men’s titles) and is a member of the World Horseshoe Pitching Hall of Fame. Currently, Walter Ray Williams, Jr. still competes on the PBA National and Senior Tours, and was awarded the PBA Senior Player of the Year for 2012. Take your bowling game to the next level! In this comprehensive download, Coach Bill Hall draws upon his extensive playing and coaching experiences to explain the essential components needed to become a great bowler. You'll learn first-hand the tips and techniques he has used to help many of the game's top players reach their full potential. Among the topics covered are: equipment, lane conditions, key elements of techniques, adjustments, drills, shooting spares and practice tips. This download helps to make bowling an enjoyable experience that will change your game forever. 45 minutes. Bill Hall's experience as a ball driller and coach on the Professional tour, along with his 12 years experience as a coach for international teams, makes him one of the most knowledgeable figures in the sport of bowling. Hall has trained such great players as Norm Duke, Danny Wiseman and several other notable bowlers. He has coached professional bowlers to every major title known in the sport of bowling. Bill Hall's teams have won Gold Medals for every country he has coached on the international level. This download features expert instruction from World Bowling Hall of Fame bowler Diandra Asbaty. The program provides numerous drills and tips that will help you to develop a consistent and reliable game. Among the topics covered are: how to walk, swing and follow through straight, how to hook the ball, practice tips, picking up spares, the mental game and more. This informative download will be helpful for bowlers and instructors at every level. 30 minutes. About the instructor: Diandra Asbaty is a 12-time Team USA member with over 60 international medals. She was the first American woman to be inducted into the World Bowling Hall of Fame. Diandra is a USBC silver certified coach and has a great passion for coaching. She began bowling at the age of 5 and has traveled to over 15 countries to compete. Hall of Fame bowler Parker Bohn III details everything you need to know to take your game to next level. Among the topics covered are: preparation, equipment, the mental side of bowling, developing a pre-shot routine, building a consistent shot, how to make more strikes and spares, and how to analyze your shot. Parker is joined by one of the top PBA right-handed bowlers, Brad Angelo. Together, they provide an endless array of tips that will improve your game, regardless of your current skill level. 59 minutes. About the Player: Parker Bohn III owns 30 career PBA Tour Titles, which ranks 5th all-time. His career earnings of more than $2.5 million rank him third all-time. Parker won five titles in 1999 on his on his way to his first PBA Player of the Year award. He also won the Player of the Year award in 2002. He was elected to the PBA Hall of Fame in 2000. The great bowlers make it look so easy. How do they consistently bowl high scores every time they play? This unique download featuring Walter Ray Williams, Jr. will help you to learn the techniques and strategies that the pros use, and what makes them so successful. Walter Ray goes head-to-head against six top bowlers. You will hear the game plan of the bowlers as they start their matches and discover the adjustments they make as the lanes begin to change. The download also features analysis and commentary by former PBA bowler Mark Baker. Now you are able to get inside the minds of elite level bowlers and apply their lessons to improve your own game.106 minutes. Walter Ray Williams, Jr. is a six-time PBA Player of the Year and the all-time money winner on the PBA Tour. With his recent 42nd title, he eclipsed the previous record of PBA titles held by Earl Anthony. Walter Ray was inducted into the PBA Hall of Fame in 1995 and into the USBC Hall of Fame in 2005. Williams is also a nine-time World Champion in pitching horseshoes (three junior titles and six men’s titles). Fred Borden and Ken Yokobosky are two of the premier bowling instructors in the game. They have travelled throughout the world, working with bowlers of all skill levels and coaching with Team USA. They have received numerous honors in their bowling careers.